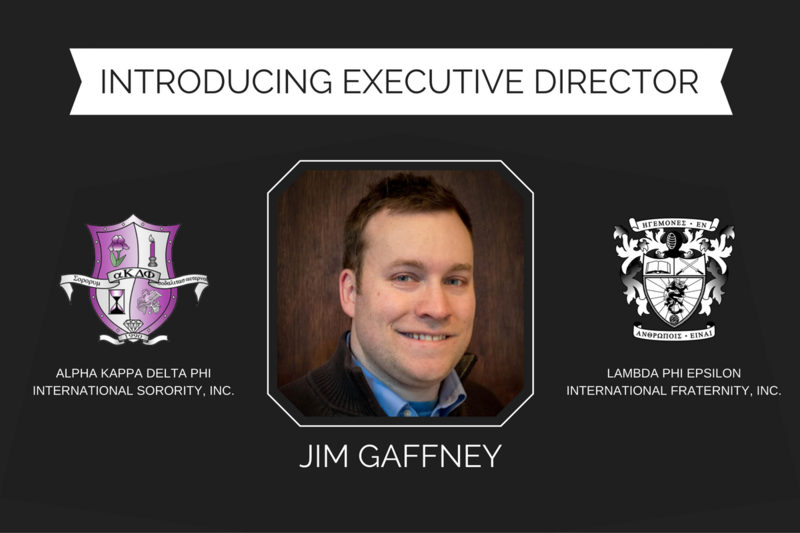 The Board of Directors of alpha Kappa Delta Phi International Sorority and Lambda Phi Epsilon International Fraternity are pleased to announce the joint appointment of Jim Gaffney as their inaugural Executive Director. Jim’s hiring becomes effective on January 9th, 2017. Jim Gaffney has worked extensively in the nonprofit arts and education sectors as both an artist and administrator. He has served the Kappa Sigma Fraternity, of which he is a 2007 initiate, as a chapter adviser, assistant regional president, regional president, and as a member of the Fraternity’s expansion commission. His work in Kappa Sigma has been recognized multiple times, having received the Kappa-Lambda Chapter (Shippensburg University) Alumni of the Year Award in 2013, and a Supreme Executive Committee Distinguished Service Commendation for his work as Regional President of Upstate New York, where he oversaw 12 establishments, adding five new chapters in the past 14 months. “We are proud and excited to have Jim join our team. He brings valuable management and programming experience essential for achieving our strategic goals,” says Lambda Phi Epsilon International President William Tan. Jim currently resides in Troy, Pennsylvania with his husband, Jordan. He will serve as the first full-time employee for both the International Fraternity and International Sorority. Founded in 1981 at the University of California at Los Angeles, Lambda Phi Epsilon International Fraternity, Inc. has grown to become the world’s largest Asian-interest fraternity. Lambda Phi Epsilon (ΛΦΕ, also known as LFE) aims to guide men on a lifelong discovery of authenticity and personal growth. To learn more, visit http://lambdaphiepsilon.com. alpha Kappa Delta Phi International Sorority, Inc. was founded in 1990 at Berkeley, California, and is the largest and only international Asian-interest sorority. alpha Kappa Delta Phi fosters the making of innovative female leaders through the promotion of philanthropy, scholastic excellence, and Asian awareness in the community while creating lifelong relationships. To learn more, visit http://akdphi.org. Congratulations Jim! Let’s meet up in LA one of these days as 2017 begin..